I have previously documented muhajireen battalions here and here. Below are two more groupings. 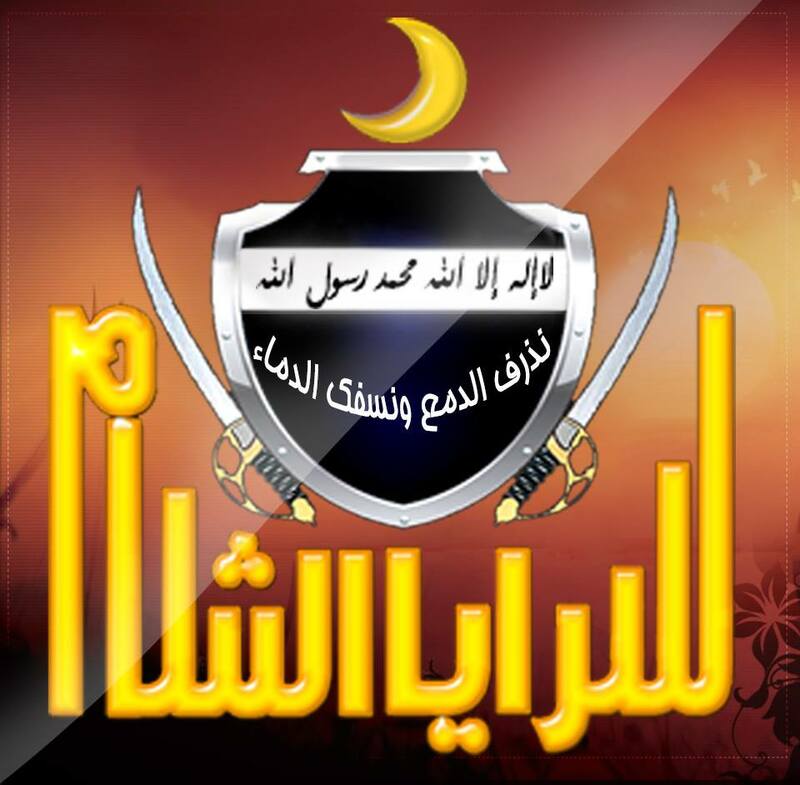 Logo of Saraya ash-Sham, whose main emblem resembles the flag of Iraqi insurgent group Jamaat Ansar al-Islam (pro-Caliphate and with deployment in Syria). The motto reads: "We shed tears and spill blood." Translating to "brigades/squadrons of ash-Sham" and operationally advertising itself since at least the autumn of last year, this group- in origin a merger of several small brigades- has been primarily active in the Homs area (including from within Homs city), and like the Lebanese-founded Jamaat Jund ash-Sham, it contains a mixture of native Syrians and foreign fighters: though according to a media activist for this group whom I interviewed, the "majority" of the group's fighters are Syrians. 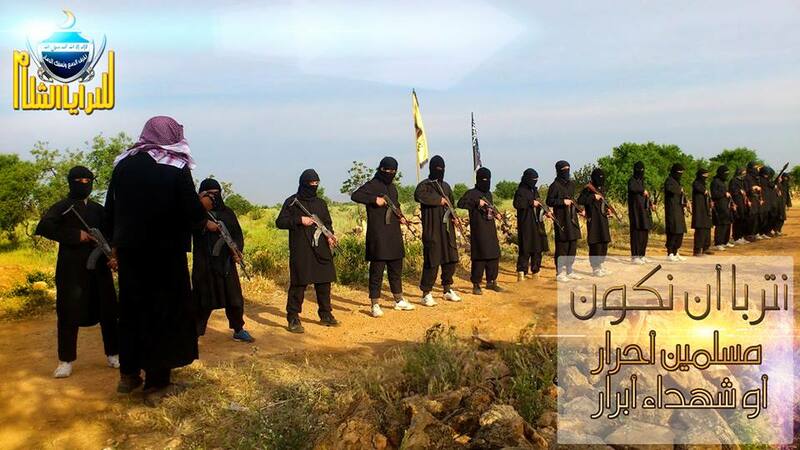 To the extent that there are foreign fighters in this grouping, they are most likely Lebanese and other Levantines. To date, no muhajireen martyrdom notices have been publicly announced. Ideologically, like most muhajireen and part-muhajireen battalions, Saraya ash-Sham espouses the establishment of a Caliphate, and officially took an anti-fitna stance on the al-Qa'ida-Islamic State of Iraq and ash-Sham (ISIS) dispute (as the media activist put it to me, "We are all brothers"), declaring support for Sheikh Muheisseni's "Ummah Initiative" back in January. Indicative of the official anti-fitna stance as well is the fact that when Sheikh Abu Khalid al-Suri of Ahrar ash-Sham was killed in February, Saraya ash-Sham did not blame anyone in particular for the killing, but simply eulogised him. The group also coordinated with ISIS, Ahfad al-Rasul and other groups in fending off an attempted regime advance on the village of Aydun in Hama countryside, near an Alawite village called Khanifis. With the regime's clearance of the city of Homs and other key localities in the vicinity, it should be noted that Saraya ash-Sham, like Jamaat Jund ash-Sham (which was driven out of Krak des Chevaliers by the Syrian army andNational Defence Forces) has largely ceased to be a meaningful entity in terms of operations. Saraya ash-Sham fighters training in the Homs countryside. Saraya ash-Sham fighters prepare to hit a regime forces base in Homs area. Saraya ash-Sham fighters with special arm patches and headbands. Despite the official anti-fitna stance of Saraya ash-Sham's position on other groups, in practice Saraya ash-Sham, like Harakat Sham al-Islam, is closer to Jabhat al-Nusra than ISIS. This is a media graphic released in February of this year dedicated to fallen Saraya ash-Sham commander Abu Zubayr al-Homsi. 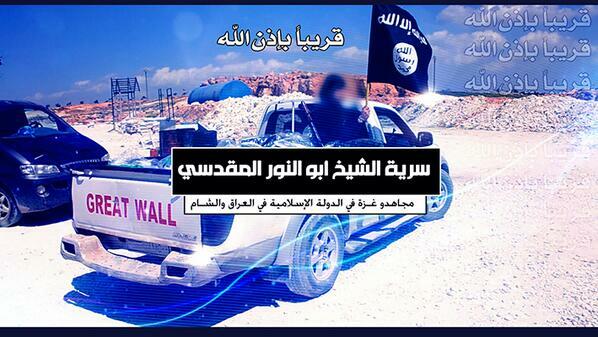 Note the Jabhat al-Nusra logo on the top-right corner. In an accompanying message, Abu Mujahid ash-Shami- an official in Saraya ash-Sham- said the martyrdom notification was dedicated to "Jabhat al-Nusra in particular." 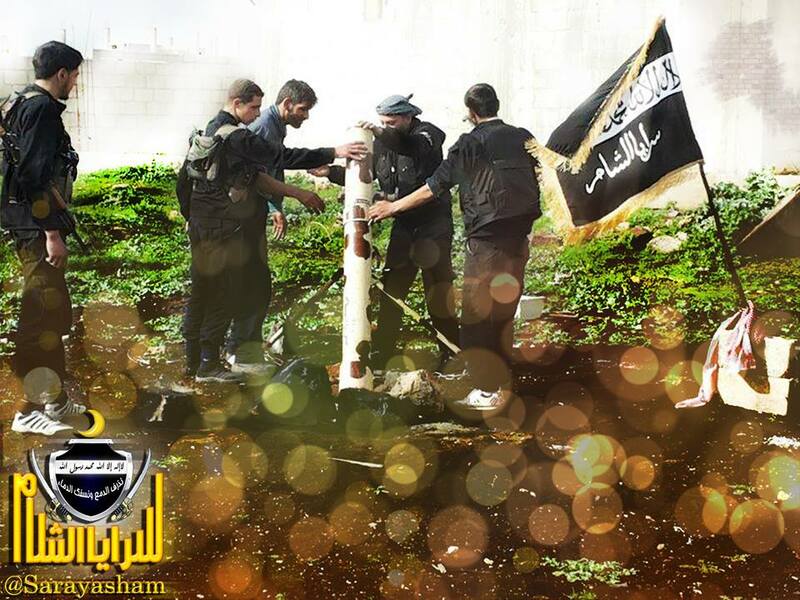 It appears there may be some personnel overlap between Saraya ash-Sham and Jabhat al-Nusra. Saraya ash-Sham graphic dedicated to slain field commander Sayyid Suleiman, who established his own brigade as part of Saraya ash-Sham in al-Khalidiya, Homs. 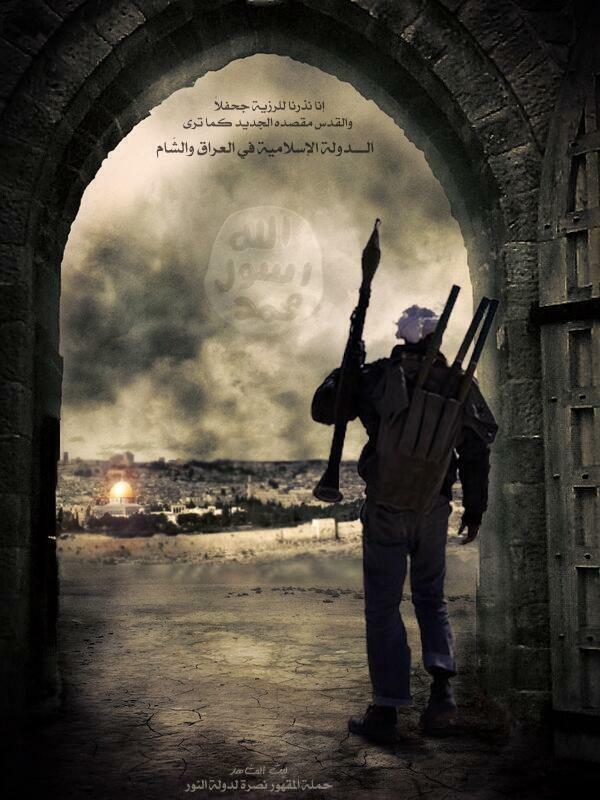 A Saraya ash-Sham graphic echoing the ISIS messaging motif of the looming conquest of Jerusalem. 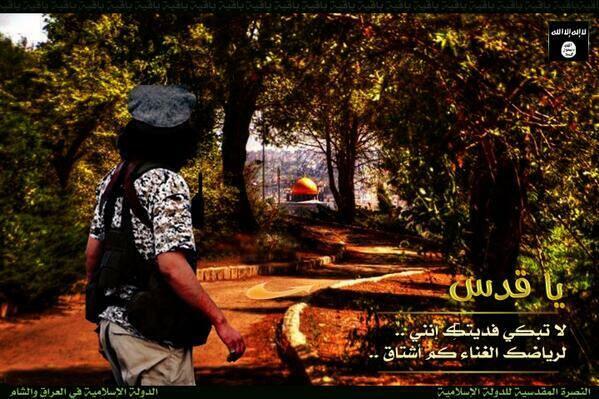 The text accompanying this graphic read as follows: "We fight in Homs al-Adiya and our eyes are on al-Quds al-Abiya." As above: "We fight in Homs and our eyes are on al-Quds." 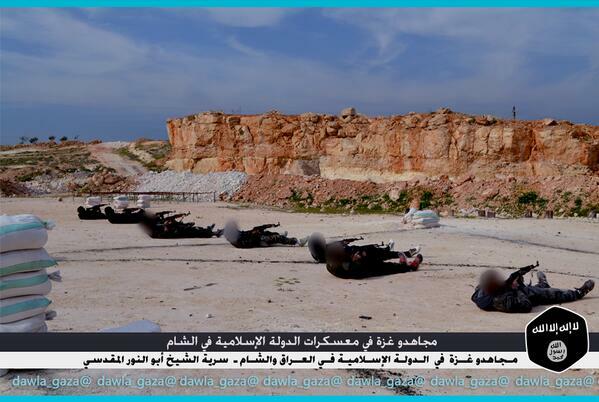 Saraya ash-Sham fighters in a training camp. From October 2013. 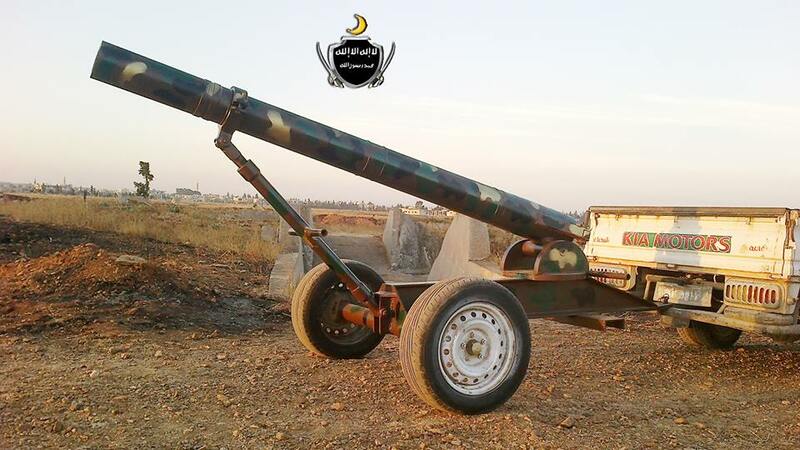 125 mm al-Quds artillery cannon operated by Saraya ash-Sham. From October 2013. Saraya ash-Sham fighters praying. October 2013. 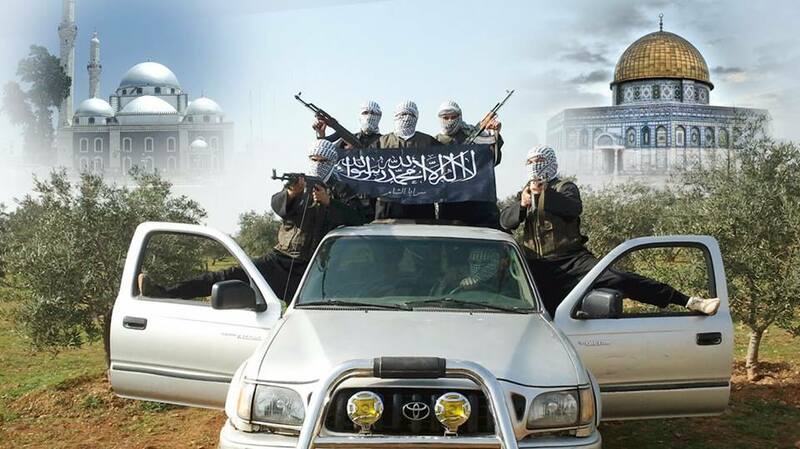 In November 2013, two more battalions joined Saraya ash-Sham: the Junud Allah brigade in Hama countryside, and the Usud ash-Sham brigade in Homs. Saraya ash-Sham statement in January of this year supporting the Ummah Initiative. 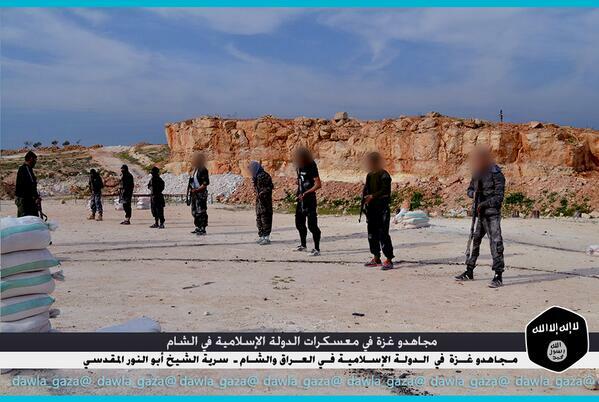 Just as ISIS has a special contingent for Libyan fighters- namely, the Katiba al-Bittar al-Libi, which previously played a pivotal role in the defence of ISIS' southern Hasakah stronghold of al-Markadah from the attacks of Jabhat al-Nusra and other rebels and is now pushing deep into Deir az-Zor province,losing a number of fighters in the process- so ISIS also has a special contingent dedicated to fighters from Gaza. This should come as no surprise. 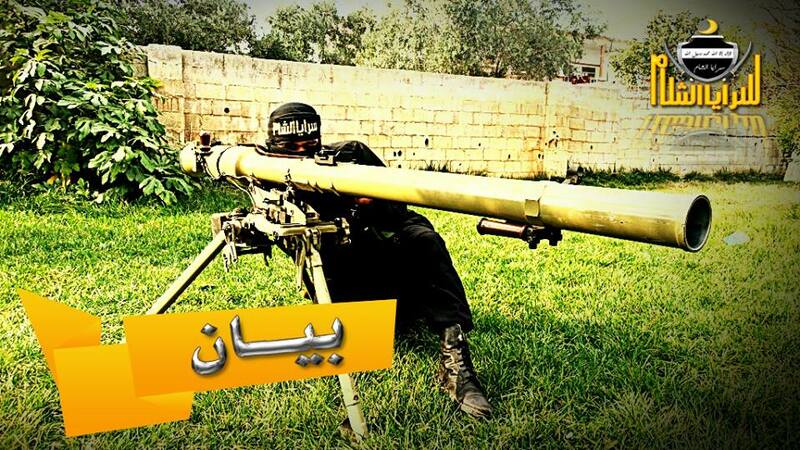 After all, images of support from Gaza for ISIS have been in evidence for nearly a year now, and when it came to the infighting between ISIS and other groups in Syria that broke out this year, the two main Gaza-Sinai jihadi groups- Jamaat Ansar Bayt al-Maqdis and Majlis Shura al-Mujahideen- came down firmly on the side of ISIS. The Gazan contingent in turn reflects the division among the Palestinians outside Syria regarding the Syrian civil war: namely, that while there is no evidence Hamas has an organized presence in Syria to support the rebels and its insistence on neutrality is to be believed (much to the chagrin of the Islamic Front), Palestinian Salafi circles have been active in assisting the rebels. 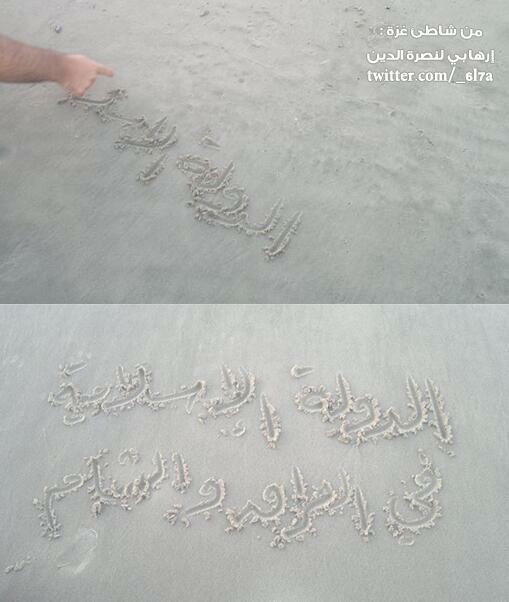 A supporter of ISIS inscribes the group's name on the beach in Gaza. Photo from September last year. The Gazan religious instructor in this study circle was killed fighting for ISIS in Syria in September last year. 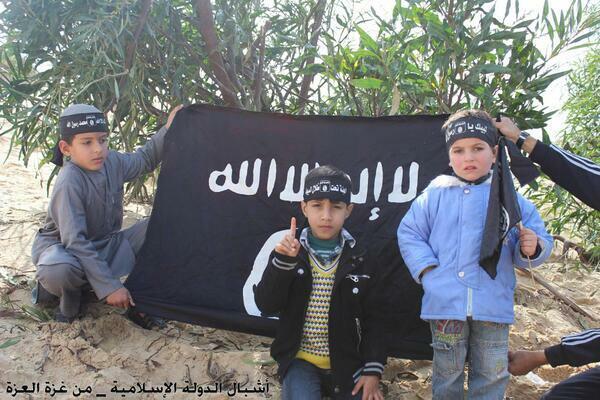 Gazan children show their support for ISIS. Photo from January 2014. 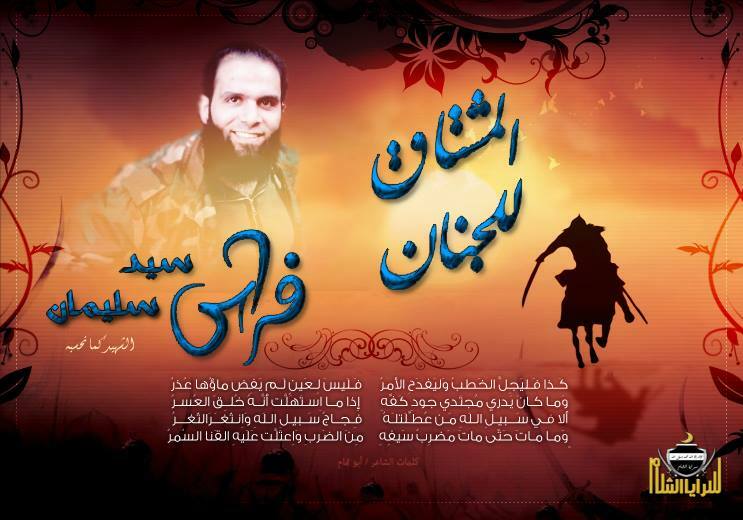 "From Gaza of glory to the mujahideen of the Islamic State: verily we love you in God. 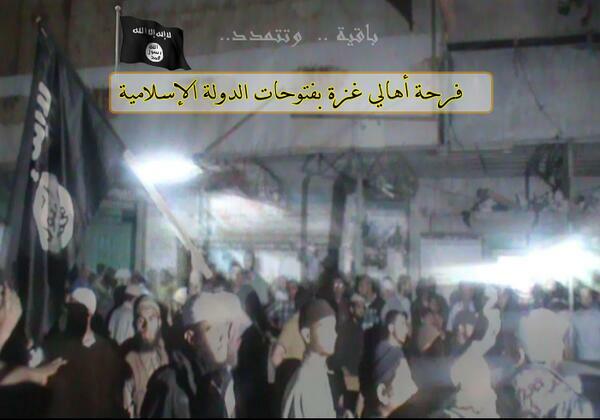 The Salafi Jihadi Movement- Gaza"- photo in support of ISIS from December 2013. 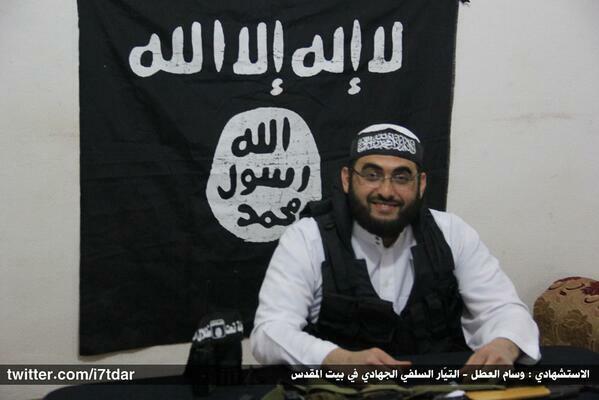 Wissam al-Atal: a doctor from Gaza who became a suicide bomber for ISIS in Syria last year. 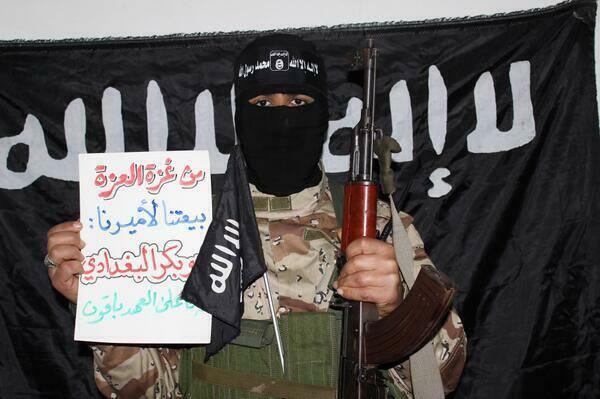 "From Gaza of glory, our allegiance is to our amir Abu Bakr al-Baghdadi"- a Gazan fighter shows his support for ISIS. Photo from February 2014. 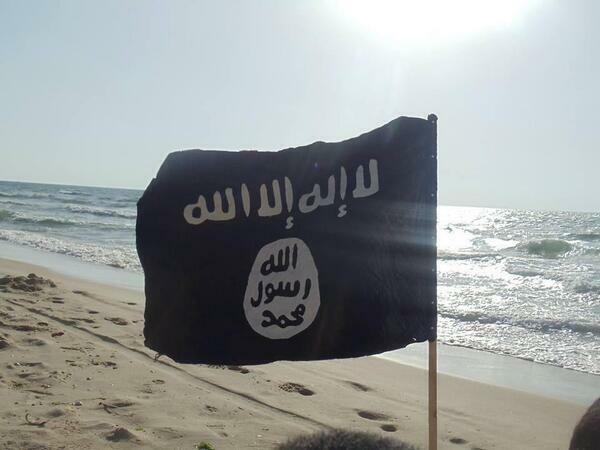 Banner on the beach of Gaza hoisted in support of ISIS this month. "Joy of the people of Gaza at the conquests of the Islamic State"- purported photo from the demonstrations held by Salafis in support of ISIS following news of the advances in Iraq. The rallies were subsequently broken up by Hamas police. 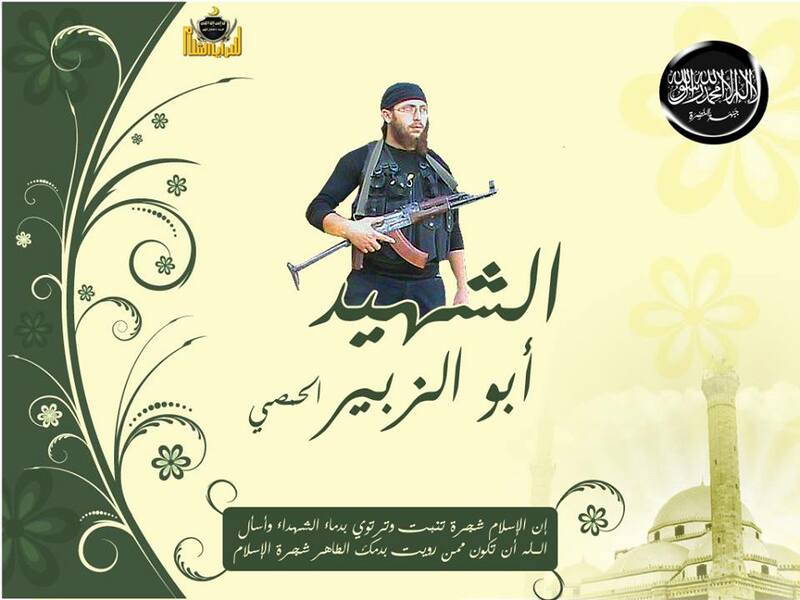 In Syria, the Gazan contingent of fighters that has emerged takes the name of the "Sheikh Abu al-Nur al-Maqdisi Brigade," named after the founder and leader of the Salafi Jund Ansar Allah group in Gaza- Abdel Latif Moussa- who was killed in clashes with Hamas in 2009. 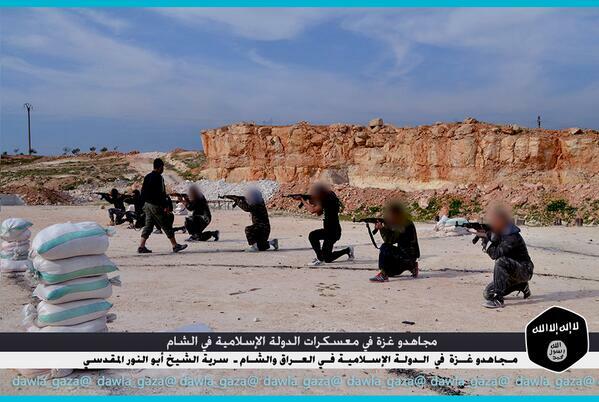 Training for the Sheikh Abu al-Nur al-Maqdisi brigade (photo released in April 2014): "Mujahideen of Gaza in the Islamic State's Camps in ash-Sham." Accompanying slogans on Twitter include "Coming, oh Jews," reflecting the ambitions for the conquest of the whole Israel-Palestine area as part of ash-Sham. 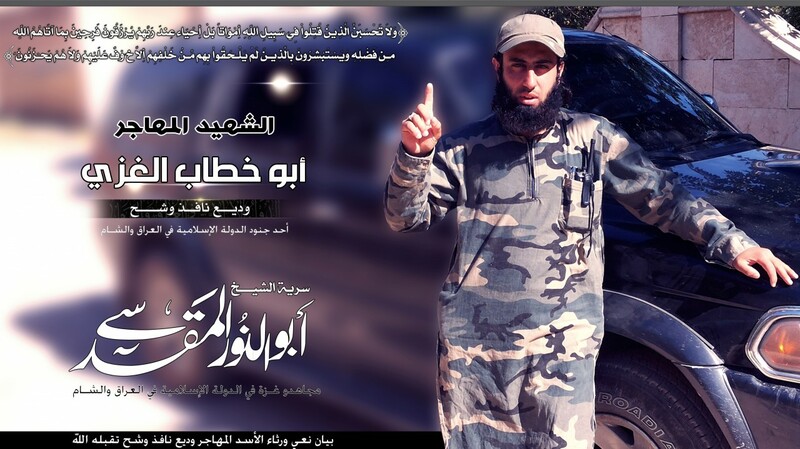 Abu Khattab of Gaza, who died fighting for the Sheikh Abu al-Nur al-Maqdisi brigade in Syria. 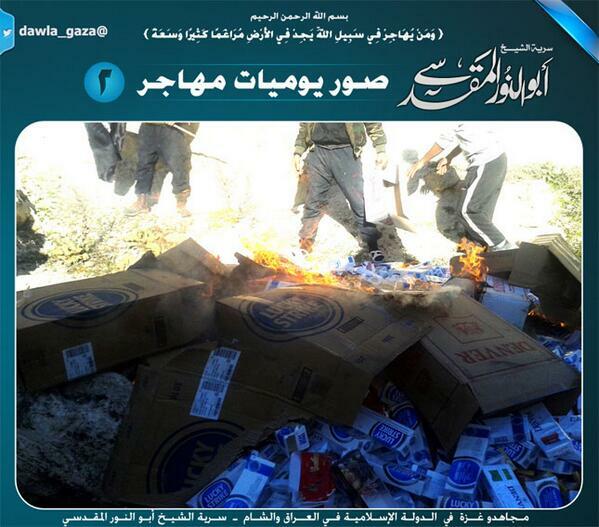 The Gazan contingent burning cigarettes in Syria. 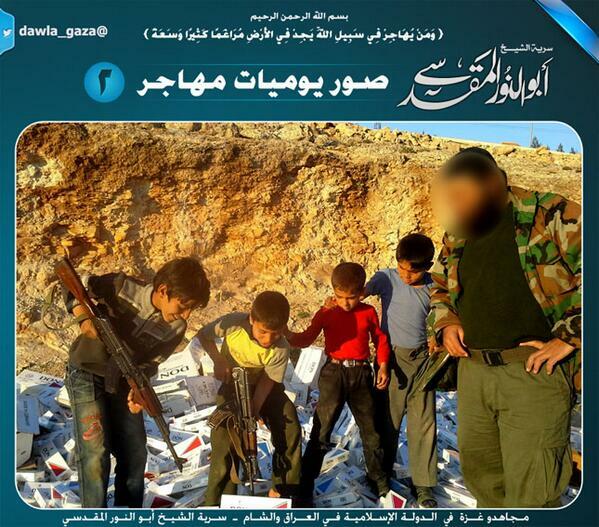 Gazan fighter shows children how to destroy cigarettes. Gazan contingent handling raw meat. As with the Katiba al-Bittar al-Libi, standard 'daily life of a mujahid' messaging. The Gazan contingent handles a gazelle for slaughter. A photo that gives an idea of where the Gazan contingent has been deployed. 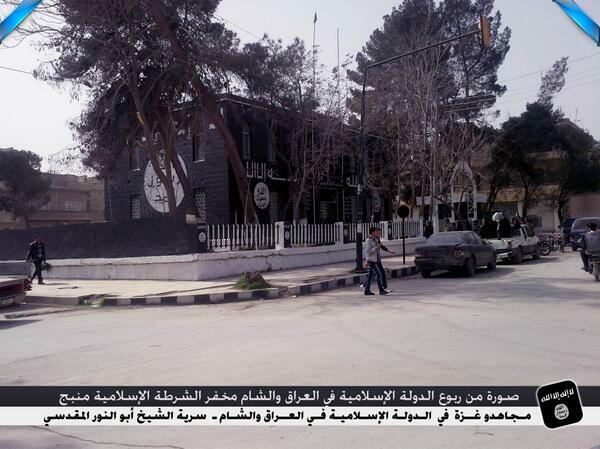 Photo from outside ISIS' Islamic police station in Manbij, Aleppo province. 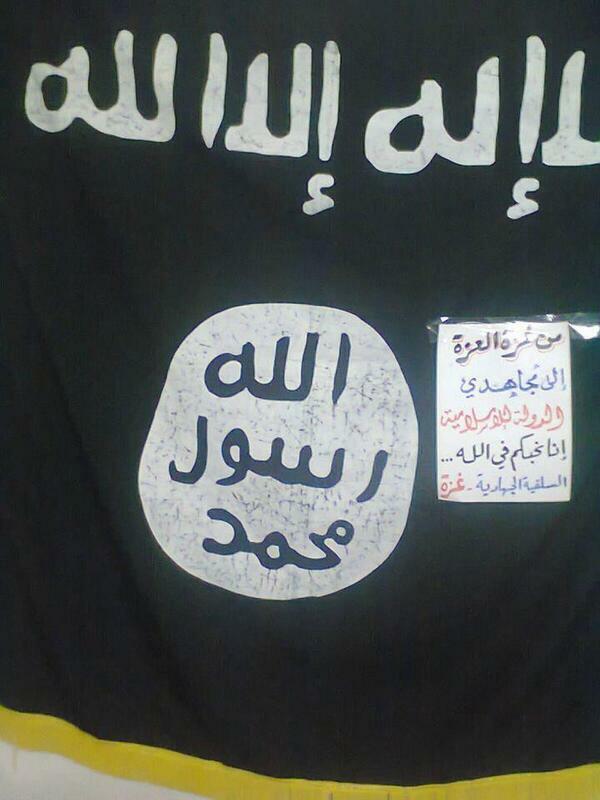 "From the mujahideen of Gaza in the Islamic State of Iraq and ash-Sham: the Sheikh Abu al-Nur al-Maqdisi Brigade." It should be noted that undoubtedly with influence from Gaza, this pro-ISIS trend is catching on somewhat in the West Bank, which recently saw three teenagers kidnapped near Hebron by a group taking its name after ISIS, though the Israeli government is officially blaming Hamas as part of a propaganda line whereby there is a reluctance to acknowledge there is a more radical trend than Hamas emerging within the Palestinian population. Perhaps the emergence of this trend should not be surprising when one considers the widespread Palestinian support for Saddam Hussein as champion of their cause. Now, with the rise of ISIS and its extensive conquests and promises to liberate Jerusalem, it seems many Palestinians will be inclined to see ISIS as their new Saddam-style saviour figure. 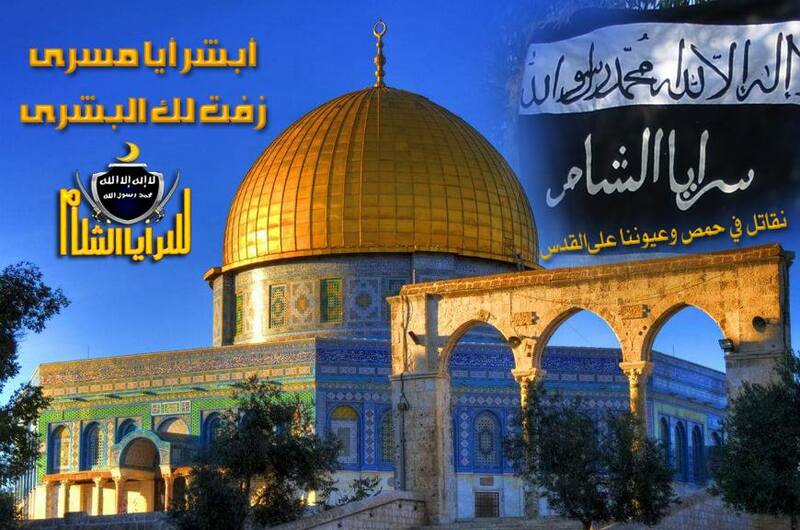 ISIS graphic on social media to remind Palestinians and the Ummah that ISIS has not forgotten al-Quds (Jerusalem). 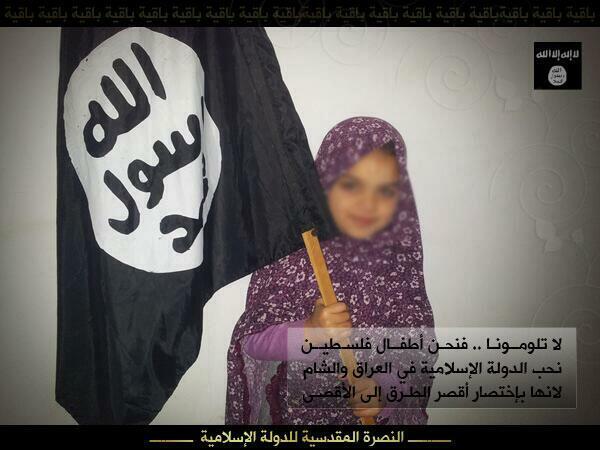 A young Palestinian girl shows her support for ISIS, which will supposedly open the path up to al-Quds. 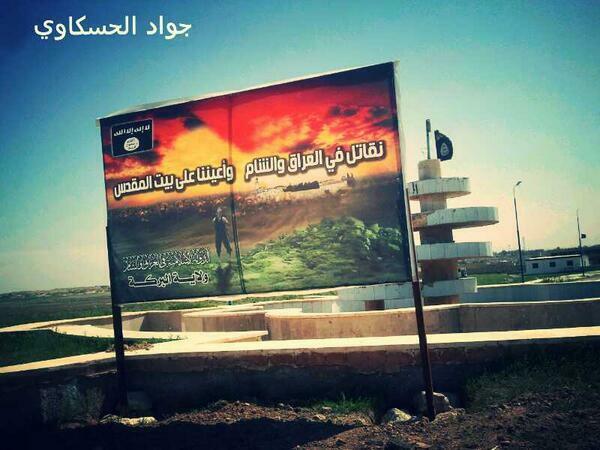 ISIS billboard in Hasakah province from March 2014: "We fight in Iraq and ash-Sham and our eyes are on the Holy House [Bayt al-Maqdis]." "Oh Quds, don't cry..." Palestinian graphic in support of ISIS. 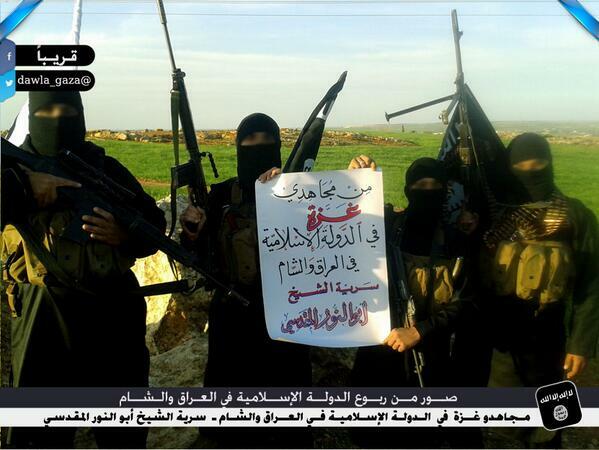 "Baqiya [ISIS slogan], Palestinian support, together in support of ISIS." Palestinian graphic in support of ISIS using Iwo Jima imagery. The main area to watch in terms of Palestinian support for ISIS is the Gaza-Sinai area, where pro-ISIS jihadis have been building their networks for some time. While the Hamas security apparatus is still resilient, as Jonathan Spyer points out, I would not be surprised if active pro-ISIS jihadis, assuming ISIS' overall status and holdings are not diminished, attempt to take over Gaza within the next 5-10 years and proclaim an emirate of Gaza aligned with ISIS.